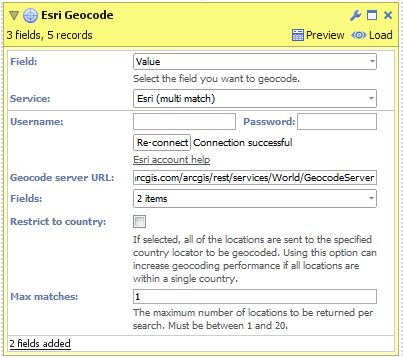 Esri (batch) - Returns the highest ranking match per location. More efficient for large datasets than using Esri multi-match. 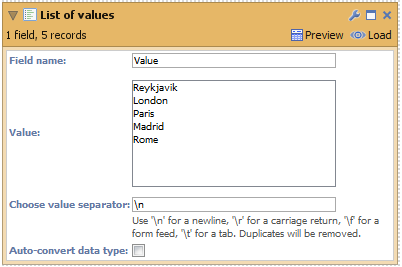 Esri (multi-match) - Can return multiple matches per specific place name, e.g. a place called "Aberdeen" exists in Scotland, Hong Kong etc. Yahoo - Yahoo BOSS PlaceFinder. Each of these services requires an account with the relevant service provider. Links to the provider's sign-up page are included in the Geocode block. Add a 'List of values' block to the DataManager workspace and insert some values (to test the feature) or use a dataset that already has a location field. After signing up for an account, enter your username and password then click 'Connect'. 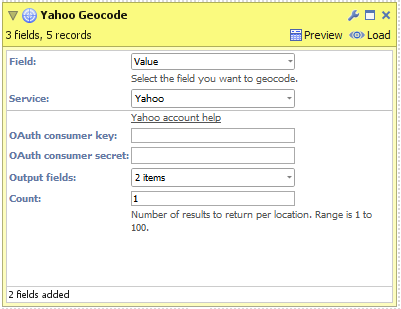 Select the fields you want the geocoding service to return. Click "Restrict to country" if all of your place names exist within a single country. This can improve the accuracy of geocoded results. Click "Execute" to begin geocoding. 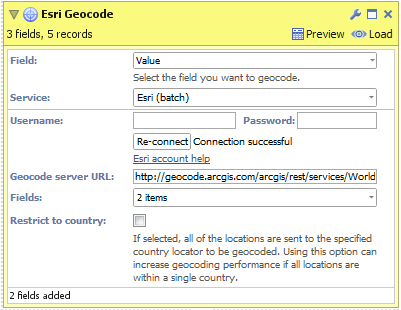 NB: "Geocode Service URL" is an advanced option for overriding which Esri geocoding service Omniscope will use to generate results. Configure "Max matches" to select how many results you would like returned for each input place name. After signing up for an account, enter your OAuth consumer key and secret then click 'Connect'. Configure "Count" to select how many results you would like returned for each input place name. Load the data into Omniscope to see the geocoded place names and visualise the data in the Map View.